… and you ignore it at your peril! It’s now a word that is followed by an eye roll; it’s one of those things that you’re told you ‘should’ be doing to look after yourself, but somehow you seem to find a million other things that are far more interesting. Because it’s become a ‘buzz word’, resilience appears more and more frequently and, like anything, the more you see it, the less you take notice. You’re bored with it because the training you’ve been offered isn’t interesting and is often unrelatable to YOUR life. And let’s face it: if you can’t relate to it, you’re not likely to worry about why you might need it. 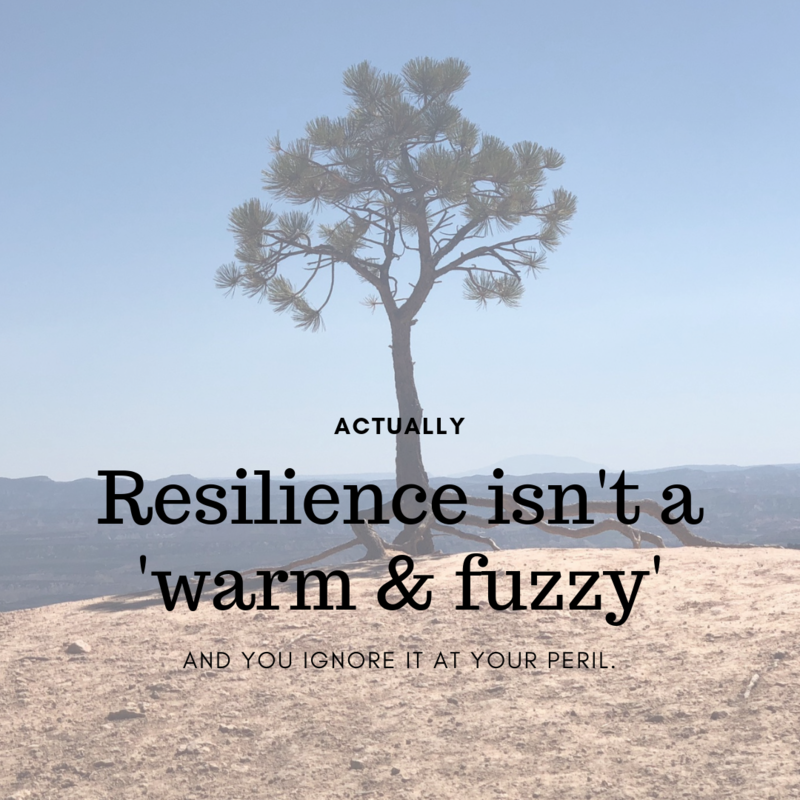 In addition, resilience has been dumbed down to such an extent that people now think that being resilient means not getting sick when things get a bit stressful. Ultimately, this has led to resilience being seen as a ‘warm and fuzzy’ training session that organisations provide for their people in an attempt to address increasing health and well-being issues. So, what is resilience and why do you need it? ‘…the ability to successfully cope with a crisis and to return to pre-crisis status quickly. Resilience exists when the person uses mental processes and behaviours in promoting personal assets and protecting an individual from the potential negative effects of stressors’. Put simply, it means that when you are resilient you can calmly deal with any crisis or chaos that presents in your life AND you can move on without any long-term, negative consequences. Generally, it means you build inner strength regularly so that when things happen in your life you can recognise them as a challenge, find effective ways to deal with them and then move on. What do highly resilient people have in common? Most importantly, highly resilient people don’t get caught in the spiral of emotion that often comes with a challenging situation in life. They have the ability to step outside the ‘story’ of the situation and calmly transition through it. How do you know if you need to build your resilience? There are so many different things that can impact you from every corner of your life. You might well have mastered the art of making everything look effortless on the outside… but it’s what is happening on the inside that really counts. One of the best ways to work out whether you need to build your resilience is to ask yourself a few simple questions. Get stuck and feel like you can’t move forward? Feel like you get completely overwhelmed by the issue? Feel like the issue takes over your whole life? See the challenge as being hard and difficult to bear? Feel like the weight of the challenge might finally break you? It doesn’t matter what your answers to these questions are. The answers simply give you the point from which you make your start. Resilience isn’t something that you either have or you don’t. It’s a skill that you develop over time, and once you have it, it’s a skill that you have to continually maintain so that you are fully fuelled and ready to go when your next challenge arrives. The demands and the speed of life are only going to increase – we’re already seeing the impact that stress creates every day. With the constant improvements in technology and our corresponding ‘connection’ to the world, this also means that the highs and lows of life seem to come more quickly… and with significantly more impact when they do arrive. Your first step in building resilience is to be really honest about where you are at right now. Use the questions above to get a gauge on how much of an impact the challenges in your life are currently having. If you have a few areas that need some work, then start by focusing on those. Simple steps each day will help you to build your resilience so that when things do come up in your life they’re simply an experience, rather than them completely sideswiping you. It’s time to take control of your life and build your resilience. There’s nothing warm and fuzzy about making sure that you can transition through life with the greatest of ease. You can find more great ideas on how you can start to build your resilience and start thinking a little bit differently in my free email series – it’s full of articles and videos to help you to begin your journey. Simply click here to start you on your way. There are also loads of practical and simple tips and exercises in my books ‘Keep It Super Simple’& ‘The Economy of Enough’ – you can buy your copy from Amazon. Want to chat? Email me on [email protected] or call me on +61 438 624 868 and we’ll set up a time! Bronwen Sciortino is a Simplicity Expert, Professional Speaker and the internationally renowned author of ‘Keep It Super Simple’ & ‘The Economy of Enough’ – You can follow her at her website; Facebook, Instagram, or LinkedIn. Bronwen Sciortino is an internationally renowned author & simplicity expert who is interviewed globally about her simple and practical steps to living differently. An author, mentor, speaker and facilitator, Bronwen spends every day teaching people to de-stress, build resilience and embrace change. Working with people globally through corporate programs, conference platforms, retreats, professional mentoring and in the online environment Bronwen shares her secrets to success and inspires individuals to simplify their lives and easily embrace change.